Haute Whimsy: On the Go! Whenever I hear the words "go girl" I internally cringe at the cheesiness of the phrase. I've never been a fan. But I've recently found a new appreciation for those "icky" words, thanks to Go Girl Energy Drinks! Although I drink more caffeine than I probably should, I just haven't had very good luck with energy drinks. They taste terrible and make my heart feel like it's going to explode! 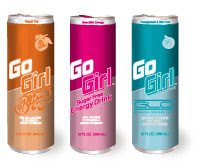 So it was a complete surprise when I was offered an energy drink called Go Girl- AND LIKED LOVED IT! This company is amazing! They offer three flavors (Go Girl Sugar Free, Go Girl GLO & Go Girl Bliss) in adorable slim and tall cans, and the best part is that a portion of the proceeds goes to either breast or ovarian cancer research, depending on which flavor you choose. To make these drinks even more desirable, they really are made for girls! Each can contains only 5-35 calories and a mild herbal appetite suppressant, plus vitamin E and aloe for your skin, and a boost of calcium. The only downside is that they are fairly difficult to find in stores, but I just saw that the site has an awesome locator that will show you which specific stores in your city carry it! And I love the colors of the cans ;-) Thanks for sharing this!! Hmmm I am now craving one by how you described it and I don't even know what it taste like. I think I am just thirsty. I'm gonna look out for these to try them. I'm not really into energy drinks either. I feel like I'm being forced to drink medicine when drinking one. thanks for following me! i've got you in blog list! Those drinks look so cute! Those drinks are d-lishes! Haha, soooooooo cheese and all I guess I am a go girl! PS. I love your blog and just added you to my list!